MP Pro Stock Scanner is the only scanner on mobile that works absolutely in real-time. Find stocks that you can act on now, not after market closes. Auto Scan puts machines at work for you. 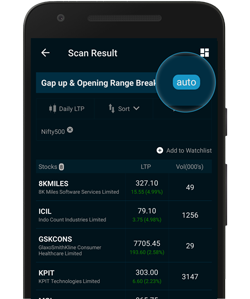 When you enable "Auto Scan", MP system will continuously check for new stocks that match your criteria and alert you within seconds. Easy Interface. No Coding Required. Easily combine & customize to create your own expert scan without writing a single line of code. 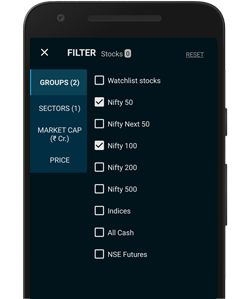 With filters on market cap, sectors or price range, you can define your universe to only see interested stocks. Get started from the word Go by choosing from a vast array of ready-made scans built by our technical experts. All without writing a single line of code. Markets don’t always move when you expect them to. 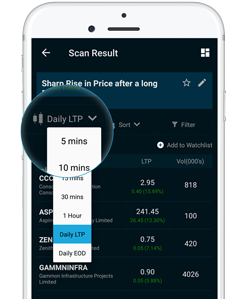 With real-time watchlist and alerts, you are sure to catch every beat. Full fledged charting solution with real-time data, noiseless charts, pattern recognition and auto signals. Missing opportunities hurt Traders the most. Don't let that happen to you. Set strategies & get alerted on signals or simply set a price trigger. "If you want to trade & not gamble, look no further. 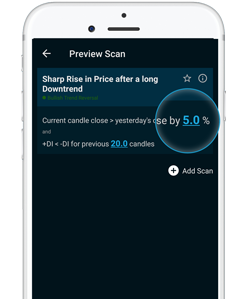 This app has everything for a professional trader." "Finest app created by the brightest minds." 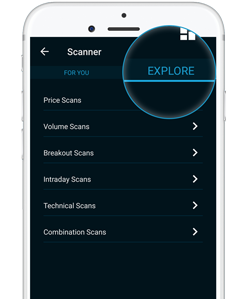 "With scanner, charts, watchlist & alerts, its a complete package for traders & investors."